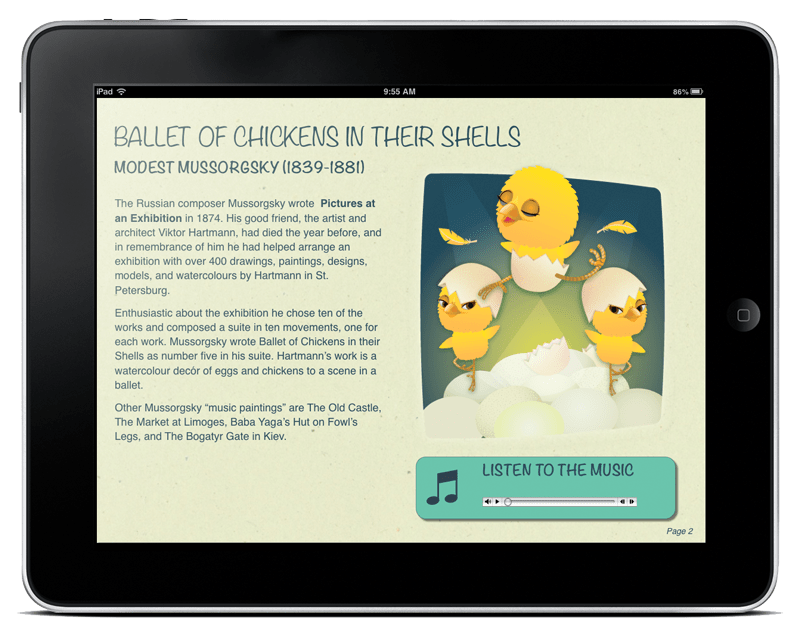 Over the last year I have been working on an interactive textbook for iPad; Anna’s Animal Music. 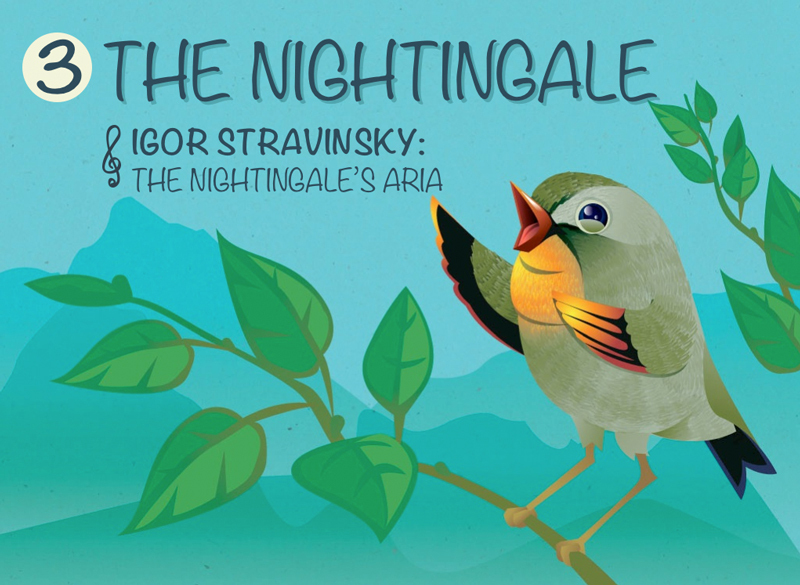 The book is teaching children all about classical music by examining 8 pieces of classical music based on animals, and telling the story about the piece, the composer and the animal related to the piece. This was a bit of a mammoth project for me, but a very fun one at that, as I got to use both my design and illustration skills and to mix it all up with interactive pieces. The book is written by Anna La Cour-Harbo, a musician herself as well as a published author and music teacher. This is one in a long line of books she has written, but it is the first that is interactive. 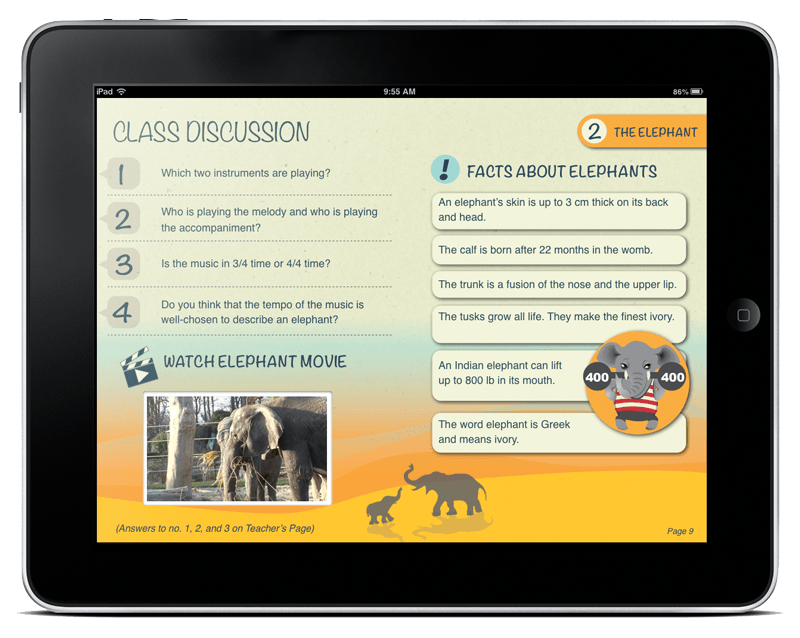 The media seems to lend itself perfectly to this kind of text book as we were able to include actual music into the book – listen to it as you learn about it- footage of the animals and quizzes where the child can drag and drop and tick the right answers. It speaks to more than one sense and that should make the learning experience so much more fun I would think. We used iBooks Author to create the book. 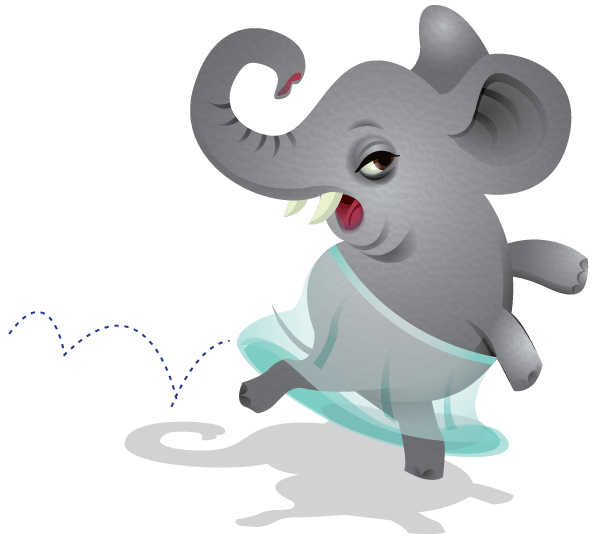 iBooks Author is an e-book authoring tool by Apple and it is still fairly new, they created this software for educators and smaller publishers to create their own books, so it was just perfect for Anna and her vision for her new book. Working with iBooks Author was both amazing and challenging. The great aspect of it was that it allowed Anna and I to work more closely together, in that she could set up the initial version of the book herself and have a big influence on the layout. This was an important part of the content creation, meaning she could present it in a certain order to ensure the best learning experience for the kids. I could then take her “raw” book and add design and illustrations and structure the layouts. We used a shared server so she always had an insight into the work I was doing and was able to add to or restructure the content if she felt it needed it. So in that way it was a very organic design experience. The challenging aspects of working in iBooks Author have been that at times it felt a bit like designing in Word or something like that. 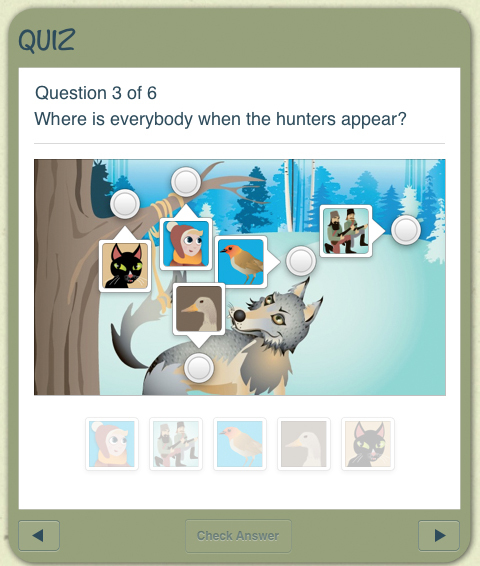 It comes with a range of ready made widgets, that Anna used to create her quizzes and movie clips, however these are strangely rigid and sometimes a bit tough to customise. iBooks Author will allow you to incorporate your own html5 widgets so that is always an option, you could create your own just like you want them. Overall this have been a really interesting and positive project and I am proud of the outcome. You can see the book and buy it here. © 2016 Helmetgirl's Blog. All rights reserved.